Oh hey friends! I am super excited to be sharing a dairy-free version of the Yule Log that I make for my family every Christmas. It's an icebox cake that's normally made by layering thin chocolate cookies with whipped cream, and then freezing. The cookies absorb some of the moisture from the whipped cream, and it changes to a cake like texture. I also made the sweetest meringue mushrooms for this recipe! They were so easy, and can also be made way ahead of time and kept in the fridge. Things I love about this recipe. It's festive. It's simple. And you can make it way ahead of time and pull it out of the freezer when you're ready to serve it! So let's talk about this dairy-free business. This is great for those with a dairy allergy, or if you're vegan! I used chilled coconut milk to create a coconut "whipped cream", and it worked so well. I didn't find the coconut flavour overwhelming either, especially if you add in your choice of flavouring. I used vanilla, but caramel or peppermint would be yummy as well. Not interested in the dairy-free version? Here's my other version that uses whipped cream! 1) Open 1 can of coconut milk upside down. Pour off coconut water and set aside (this is great to use in a smoothie later), and scoop the white solids into a medium sized mixing bowl. 2) Use handmixer (or standmixer) to beat coconut cream on high speed until peaks start to form. Add in 1 heaping tablespoon of icing sugar (to taste), and 1 tsp vanilla. Mix well. *Consistency will vary with the brand of coconut milk. Some will be more solid vs others. I found the Trader Joe's brand to be awful. Don't use light coconut milk, and try and avoid guar gum (it inhibits whipping). 3) Place a piece of parchment into a seal-able container, this is where we will build the log as it's easy to seal and place in the freezer. 4) Select a chocolate wafer, spread about one tablespoon of coconut cream onto the wafer, and place coconut cream side up onto the parchment. Repeat, and place next wafer on top of the first one. Keep repeating this step until you have about 10 wafers stacked. Gently flip so that the wafer edges are now touching the parchment, and the log form is taking shape. Repeat steps to make another stack, and join to the first one. Repeat until you run out of wafers or coconut cream. Place into the freezer for a few hours until frozen, or up to a week. 5) Repeat steps 1 and 2 with remaining coconut millk and 1 tablespoon of icing sugar, 2 tablespoons of cocoa powder, and 2 tsp vanilla. Adjust to taste. (I like mine not so sweet, so you may want more sweetener). 6) Pull the frozen log out of the freezer. Cut a 3 or 4 inch piece off of the end diagonally. Place this on top of the log, as this will form a branch. 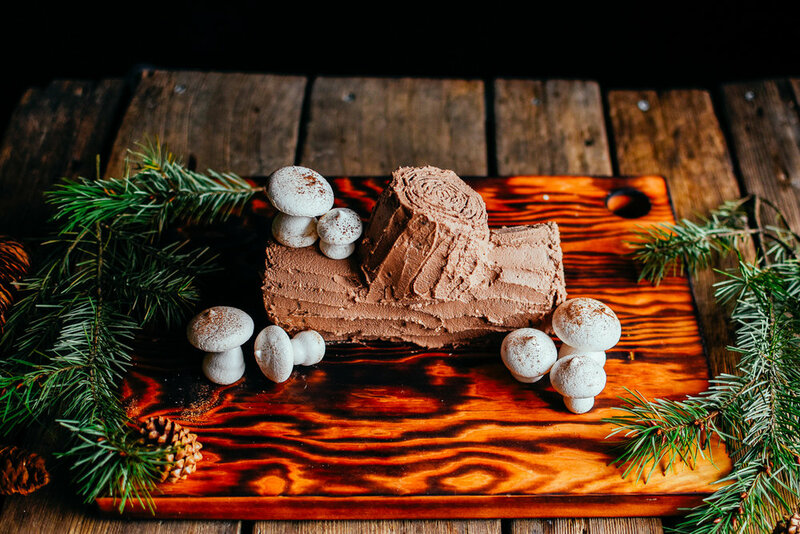 7) Use chocolate coconut cream to decorate the log. I created a bark texture by running my offset spatula (or knife) along the cream. I used a toothpick to create tree rings on the ends of the log and branch. 8) Keep in the freezer until about 20 minutes before you're ready to serve it! The wafers will absorb some of the moisture from the coconut cream, and create a cake-like texture. Dust with icing sugar directly before serving to act as snow if you wish. recipe from: Joy of Baking - she has a wonderful video tutorial for piping the meringue! 2) In a medium bowl, use a handmixer to beat egg whites and cream of tartar together at medium speed until soft peaks start forming - they will be quite foamy at this point. This will take a couple minutes! 3) Continue mixing at high speed, and gradually add in white sugar. Continue mixing until mixture is shiny and stiff. When you rub a bit between your fingers, you shouldn't feel any sugar granules. This will also take a few minutes, so be patient. Add in vanilla and mix well. 4) Place meringue mixture into a large piping bag with a round tip, or a plastic bag and simply cut the tip to the size you want. 5) Place parchment onto a large baking sheet (use a dot of meringue under each corner to ensure parchment sticks to the pan. 6) Pipe caps: pipe 2 inch circles that are about 1 inch high - this takes practice. You can always scoop them off the parchment and back into your bag if you need to try again. 7) Pipe stems: the stems are a little trickier - you want to start piping close to the parchment, and slowly pull up while continuing to add pressure to the bag. You want 1 inch high cones. Make a few extra stems as they sometimes will fall over while baking. 8) Bake at 250 degrees F for about an hour. This will depend on how humid it is in your area. You'll want the meringues to have a very light cream colour to them, and to come off the parchment easily when you try and pick one up. I like to shut of the oven after an hour or hour and fifteen minutes, and let them dry out a bit more in the warm oven for a few hours. 9) Melt a bit of chocolate to use to put mushroom caps onto the stems. Use a knife to carve a small dip into the mushroom cap, dab or pipe a bit of chocolate inside, and place onto a stem. Repeat until all the caps and stems are used. 10) Dip a pastry brush into a bit of cocoa powder and dust mushroom caps and bottoms of stems with cocoa to act as "dirt". *Store in an airtight container on the counter or in the fridge for up to 3 weeks. I hope you have the loveliest Christmas! And if you make this, please tag me on instagram!